The history of Penge dates back to beyond the Domesday Book. It is recorded in a document of 957 AD by King Eadwig, a Saxon king. The word Penceat has Celtic/Welsh origins and means ‘top of the wood’. Much of what we know of Penge was part of the Great North Wood and situated in the extensive Manor of Battersea. The beginnings of the settlement have been cited as around the Parish Lane/Green Lane intersection, spreading outwards towards Penge Lane. The Crooked Billet pub is on the site of a much older pub dating back to the seventeenth century. The boundaries of Penge extended far and wide and much of Penge Common was used for grazing sheep or cattle or was a source of firewood for the poor rural community. The Scottish silk merchant William Sanderson bought a plot of land and built a house there which he called Annerley. It was, he explained ‘the annerley (only) house in the area.’ Hence Anerley. When Penge common was enclosed and the land sold off from the 1780s (further encouraged by John Barwell Cator in 1820) the impact on the rural community was considerable. The Croydon and Anerley Roads were laid out, the Croydon Canal excavated then opened in 1809 and the first of the relentless building started in 1827. Londoners were able to reach the rural delights of Penge via the canal, perhaps stopping at the Anerley Tea Gardens for refreshment, dances, or even to see a firework display. The popularity of Penge continued with the coming of the railways in 1839 and the transfer of the Crystal Palace from Hyde Park in 1854 to the verdant grounds of the now demolished Penge Place. Green spaces were preserved — the last vestiges of Penge Common — and became official parks or ‘recreation grounds’ circa 1890. Their opening ceremonies were grand affairs with banquets, concert bands, processions of dignitaries and speeches. The parks themselves were superbly maintained. The brilliant quirkiness of the Royal Watermen’s Almhouses emerged in Penge in 1840; the Tudoresque King William IV cottages, designed by Philip Hardwick, in 1848. The Tea Gardens closed down in 1868, outshone by the new, gleaming Crystal Palace, and the Victorian build continued apace. Visitors to the Palace went down to Penge to partake of the twenty or so pubs then trading successfully. The oldest surviving police station in London (until 2010) was built in 1872. Affluent, even illustrious, people moved into the area. Ira Aldridge, the great Afro-American Shakespearean actor, was married in St John’s Church, on Penge High Street, in 1865. The celebrated poet and ghost-story writer, Walter de la Mare, wrote some of his best work while living in Anerley from 1906 to 1925. Penge grew from a hamlet of only 1,159 inhabitants in 1851 to the 18,000 or so we have now. The Penge Urban District Council was created in 1900 and lasted until 1965 until taken over by Bromley. Trade and commerce thrived with great stores like Rogers with its art deco restaurant and a colourful Maple Road market. Penge aspired to being a centre of entertainment with the splendid new Empire Theatre, opened by the celebrated music hall star, Marie Lloyd, in 1915. Many great artists such as Frankie Laine and Bruce Forsyth played there. The theatre had its own repertory company, presenting a new show every week. Many residents still remember the lavish pantomimes. The Empire became the Essoldo cinema after the Second World War, installing the first Cinemascope/ stereophonic sound system in South London. A casualty of the impact of television and possibly its rival, the more modern 1937 Odeon, it was demolished in the early sixties. Anerley Town Hall also continued a lively tradition of music and performance. Penge was one of the most heavily-bombed areas of the blitz on London. Perhaps the German bombers were aiming for the Penge East tunnel with its direct route to the coast and kept missing their target, their bombs falling elsewhere. The flying bombs of the later years of the war did widespread damage. The new building programme changed the look of Penge forever with the demolition of streets of much-loved older houses and creation of the modern Groves estate. During the Festival of Britain in 1951 Queen Adelaide Court was awarded a certificate of architectural excellence. Its brutalist design clearly references the adjacent King William IV cottages with its three-sided structure and the central garden. In the early twenty-first century Penge is undergoing a time of growth and change. Some of the local schools have been rated ‘Outstanding’ by Ofsted. New businesses have taken up residence, for example the popular Alexandra Nurseries in Parish Lane and the successful interior furnishings company, Designer Drapes. House prices have increased, possibly owing to the vast choice of Victorian and modern design on offer. New people moved into the area perhaps attracted by the sense of a diverse and thriving community and the attractive village atmosphere. The entertainment tradition has continued with the new professional Bridge House Theatre, not to mention music and comedy events in local pubs and restaurants such as the Goldsmiths Arms, the Bridge House and Blue Belle. A colony of artists continue the tradition set by Camille Pissarro and others. The annual Penge Festival celebrates all that’s good in the community and has done so for over forty years. Penge has its own virtual website and community-led group, the Penge Tourist Board. With the proposed re-designing of two squares on the Penge High Street and their consequent redevelopment, the formation of a Penge Heritage trail, Penge is moving into the twenty-first century with confidence. 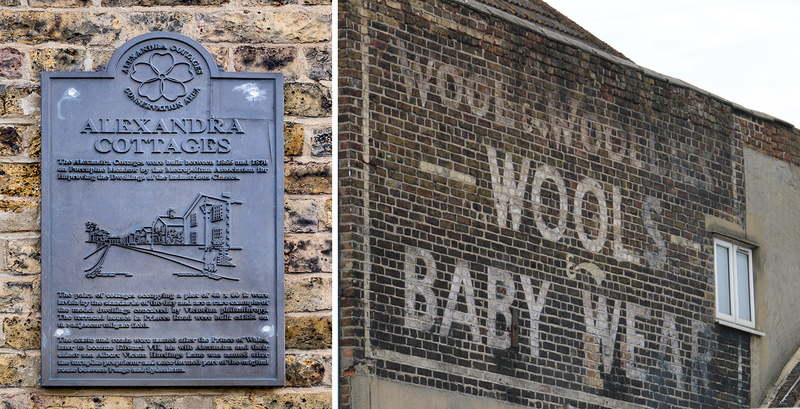 From the obvious Victorian grandeur of the Royal Waterman’s buildings to smaller, hidden details, the story of Penge can be discovered in its architecture and streets and heard in the tales of the local community. Thank you to Chris O’Shaughnessy for this page. 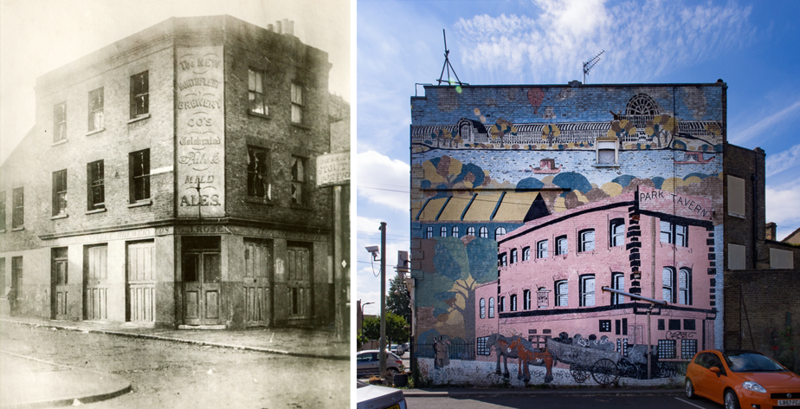 "Penge grew from a hamlet of only 1,159 inhabitants in 1851 to the 18,000 or so we have now. "